We are pleased to share some of the feedback from our parents and families. Hume Park DL Program has been a home for our children for the last eight years. This is the only school our four children have ever been to. We have gained so many benefits as a family from being part of this program, it is hard to list them all. This unique program allows our family to learn together at our own pace. Our teachers give amazing support and guidance for each of our children and we adjust learning plans to meet their individual needs on a continual basis. Our school community is very supportive and we feel at home at this wonderful location. Our children feel very happy to go to school, and look forward to their classes and all their activities. Although most families that attend this DL program live in New Westminster, we live in a different school district, but we are willing to commute in order to get the exceptional education that only this program offers. Our teachers are “master” teachers; they provide us with lots of thought provoking assignments and many fun activities. There are no bullies at this school and we are very happy here. I am getting close to graduating from Hume Park Home learners and I don’t want to leave this school, it is like a second home to me. The teachers, the location and the programs provided make it such a special place to learn and grow. The Hume Park DL Program offers a unique opportunity for students to experience blended learning environments and benefit from the direct instruction of the Hume Park Teachers as well as the opportunity to practice working in collaboration with other students. I’ve been in this program from kindergarten to grade 9. It’s helped me learn and grow in so many ways and every day I feel grateful that this program was here for me. The caring and supportive community has always felt like a family to me. My cousins children attend this program and she always raves about how wonderful it is! We have always loved it here at Hume Park Home Learners. Its a community of fantastic parents and teachers. My son started in grade 1 and is now in grade 6. My daughter who has been coming since she was a wee babe started Kindergarten this year. My son loves that he is able to make decisions about his learning and therefore make choices about what interests him. He values and appreciates that he can make these choices. My daughter who is very social loves everything about her days at Hume Park. My daughter has complex medical needs and this program makes me feel great that she is able to be in a school like setting yet have the support and flexibility where needed. I need and love this program. My kids thrive in it. My three sons attended New West Home-Learners for a number of years with the youngest completing the program almost 10 years ago. We all have fond memories of our time there. I believe this unique program has been instrumental with guiding my now adult children to be responsible, caring, confident individuals, giving support to areas of importance to them. The close community of teachers, parents and siblings that the space allowed fostered a natural desire to learn and explore. With the sense of extended family in the facility, special interests became a reality as clubs and field trips were arranged to further consider various subjects. Each child’s interests and personal qualities accepted and welcomed to flourish. I am not aware of another program quite like this. We all need to continue to support this program. My daughter, Grade 3, is really thriving in the environment at Hume Park Homelearners. The teachers and support staff are second to none….they really know the students and support them where they are at. They care about each and every individual in this safe and caring environment. This year was the first year my son and I joined Home Learners of Hume Park. It was also the first year my son was able to enjoy the great environment this school offers and the first year I enjoyed watching him excel in his academics as well as in his friendships he was quickly making. My son, who is now at 6th grade, finished his elementary schooling at a public school. 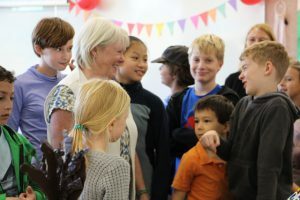 We heard wonderful things about the home learners school in New West for years, but it only came to be the absolute right place for us this year, when it was clear my son would be lost in middle school. The combination of school work and homeschooling is masterfully balanced at HLHP; my son gets to learn with his peers — his friends — at school, yet do the heavy lifting work at home, with me, at a one-on-one relationship he so craved at the regular public school. At HLHP, he learns to read, write and think critically, he gets exposed to art, music, drama and life skills, as well as the outdoors that are so exciting and so close. Parents at HLHP are active contributors. We don’t only send our children to be educated by others, we take part and pride in their education and help them socialize with their school friends at playdates as well as planned outings we join or organize. The current space HLHP reside in is a small space but is made the most of by our skilled and committed staff. They work tirelessly trying to support the over 100 student this year, making sure the kids have an appropriate space to learn, play and socialize on both shiny and rainy days. When I joined this school I was 8 years old and in 3rd grade. I was a shy, quiet child that didn’t have very many friends. The school was still at its old location, which was nice, but not quite built to run classes in. I remember walking into my classroom for the first time feeling quite anxious. It was obvious that I felt that way because I was just about to walk into a room full of complete strangers. But for me at the time, being around people in general put me in anxiety. Just the thought of having a conversation with someone made my heart skip a beat. But it wasn’t just talking to people that was hard for me; It was also doing presentations or reading out loud. Currently, I am 15 years old and in grade 9. I can now read my homework out loud comfortably in front of my class, and I just did a presentation of one of my projects for the first time this school year. I’ve also sung solo parts for the first time this year in one of the music program performances as well as performing one of the songs I wrote which wouldn’t have happened without there being a portable. Being at this school definitely taught me things. Not just about myself, but also about others. The type of environment this school has is very kind and accepting. Everyone is allowed to be who they are without being judged for it. I’ve definitely thrived from being at this school and it will always be a home to me. My two daughters have been attending Hume Park (New West Home learners) for 7 years. In total we have been enrolled for distributed learning for 9 years. We were so excited to find a program that would allow us to actually attend classes, to give our daughters a chance to be around children like themselves that were learning in a supportive and diverse learning environment. My oldest daughter is now 15 and would not be the young lady she is today without this program in its entirety. From the beginning we knew she was “Shy” and had a very hard time in social situations, we started with NWHL when she was in grade 3. Immediately we knew this school would allow her to navigate her social challenges before we even really knew what we were dealing with. At age 11 she was diagnosed with “Aspergers” ASD. Once we had this information we were able to get an IEP and start her intervention. In social situations she had Selective Mutism and was not very good at making eye contact, she would shy off to be in quite corners by herself and participating in school group projects was socially painful. Over the past 4 years the support of this school, the teachers and outside intervention she has been able to grow in ways we could never dream of. She started to come to life, to find her voice, her place in this social environment when she joined the Music Program and become part of the “Purple Banana’s”. I don’t believe in a typical school setting she would have been able to not only find out more about herself, but be fully supported, accepted and cared for by the amazing teachers. She was appreciated by and became friends with her class mates. This child who could not make eye contact, who could not even talk in social situations, is now thriving more than we ever thought possible. Last term she sang her first solo……SHE SANG HER FIRST SOLO! I hope you can understand how absolutely incredible this program, the Music Program has been for her and this cannot exist without the use of the portable. In this 3rd term, I was so excited and in disbelief to find out that she has written her own song and is going to perform this as a solo in the 3rd term. None of this, not one little bit of these amazing accomplishments could have been done without the support and direction and structure of Hume Park. Homelearners at Hume Park has become more than a school to my boys and myself. It provides a safe environment where they are allowed to learn in non-standard way and are not pressured to fit into a box. I’ve noticed a stark difference in my boys’ desire to attend classes as compared to their previous, regular school. I have seen them become more self-confident and their love to learn has grown. It is a like-minded community that provides support for its students and just as importantly, their parents. My younger sister and I are both enrolled at Hume Park Homelearners. It’s a really beautiful thing when children with diverse needs, experiences, and backgrounds, come together with talented, dedicated, resourceful teachers and staff, along with caring families, to create a healthy, supportive, and thriving community that benefits and meets the needs of so many children. The music and drama programs at Hume Park Homelearners are fantastic. Music and drama classes provide a particularly superb opportunity for homelearners to connect, as we are united by the creative spirit and the joy that creating music and theatre brings us. When I considered homeschooling when my son was 5 years old, I knew that I couldn’t go it alone. Finding the New West Homelearners Program was a gift. Both our son and daughter attended the program for 4 years and have strong memories of the friends they made and the teachers they enjoyed so much. The teachers at NWHL are, in our opinion, phenomenal. They provided interesting classes and out-trips, acted as mentors and offered a secure and safe environment for kids to learn in at their own pace. The NWHL program was so unique in that it had a bricks and mortar location. Parents would share ideas, there were classrooms to accommodate the growing number of kids in the program and there was a fantastic resource library available. It really was the perfect homeschooling situation. From what I see, Hume Park Home Learners is known for its strong anti-bullying policies and it shows. Bullying is virtually non-existent at Hume. Children are given the opportunity to grow into strong, confident adults. As a parent at Hume Park Homelearners school I highly value the program a s I have had my child learning classes in it such as Science, Social Studies, Drama, Music just to name a few. Having just the two days at Hume Park allows my son and I to do volunteer work two days a week at an organic farm & at an animal sanctuary. I truly believe that the current model is a perfect fit for our lifestyle and all other families at Hume Park. As a parent at Hume Park Homelearners I find the program is excellent and I value how it allows my child to be a successful Distributed Learner. Having the two days a week at the school as well as access to engaging in a space with other parents and being able to utilize resources such as books, learning manipulatives and workbooks is invaluable. The two days allows my child to learn and develop his social and academic skills. One day where it is a quieter environment and another where it is more dynamic. I can see how both contribute greatly to his ability to maintain positive relationships and make responsible decisions that consider the needs of himself and others while continuing to learn and apply that learning. The teachers have developed an excellent program and I trust in their judgement about how they have met the needs of their students. The results are clear when I see my child continue to grow and develop. As a Distributed Learning parent I highly value an educational environment that allows the parents and the community to be engaged in assisting my child’s learning path. Hume Park Homelearners has been a great asset in achieving these goals along with providing an environment that continues to grow my child’s social and emotional well-being. My child attends classes two days a week at Hume Park Homelearners, attending 10am to 2pm on each of those days. He is in grade three. I could not ask for a better set up for his on-site learning. His first day is Wednesday and on that day the amount of students at the school is smaller than the second day (Thursday) and this allows him to learn in a situation with the closest of his same age peers as well as be a role model himself to the younger children that attend on Wednesdays. Additionally, on this day, which is the quieter of the two days, I am able to connect with other parents in the Bistro space and access the school resources such as the library and the math resources since at this time there is more of an ability to with the less busy conditions. The school resources that I can sign out and take home are an essential part of my child’s education as my child explores and develops his learning concepts deeply at home. It is so valuable to have that in class teaching and then be able to go home and expand on it. He is highly motivated because he sees that he can apply this knowledge at school and also because he gets feedback on his learning from his teacher as we report his learning that occurs outside school and she helps assist his learning path by giving us invaluable feedback and ideas for exploring where his interests and his struggles lie. The ability to form connections with other parents in the learning community by spending time in the Bistro on Wednesdays has led to lots of community based learning. The parents have been able to organize many field trips and classes in the community where the Hume Park kids come together outside school time and pursue common interests that we have all discovered by spending time together and with our kids and eachothers kids. There have been trips to Stave Falls Hydro Dam, Capilano Fisheries, bike ride on Annacis Island, Skyzone Trampoline Park, Farm Tours, CBC Studio tour, The Vancouver Art Gallery and much more. Classes have been taken such as sewing, swimming lessons, horse riding lessons and trampoline classes. Thursdays are one feature of the Hume Park Homelearners program that is very essential to helping create children who will become successful citizens. This is the day that all the students of the school attend at the same time. Functioning in society means being able to socialize, learn and maintain positive relationships with all the people in society. On Thursdays my child can use his skills practiced in a smaller environment on Wednesdays and then apply it to the larger dynamic environment that happens naturally when all the students come together at our school. He is able to be a role model for younger children that day and also have role models that day from all the older children. My favourite story is when, after 3 days of camp, the teachers announced to all students in the dining hall “Reminder: There will be no school on Friday” and all the students moaned in disappointment. What other school ever experiences THAT? Students at Hume WANT to go to school! Hi there, I am a mother of 3 and my children have attended new west home learners for 9 years now. We started our journey here with my first, when she went to kindergarten. This program has allowed us to learn with so much flexibility in how and what we choose to learn about. My children enjoy learning as they can choose what they are interested in learning about. My 2 boys have fallen I love with the music program that is offered and we hope that would never change as it is actually one of the most important opportunities to them at new west home learners. No other public school offers the same ‘band’ experience these kids get. We are so lucky and count our blessings everyday to have stumbled across this fabulous way of learning 9 years ago.